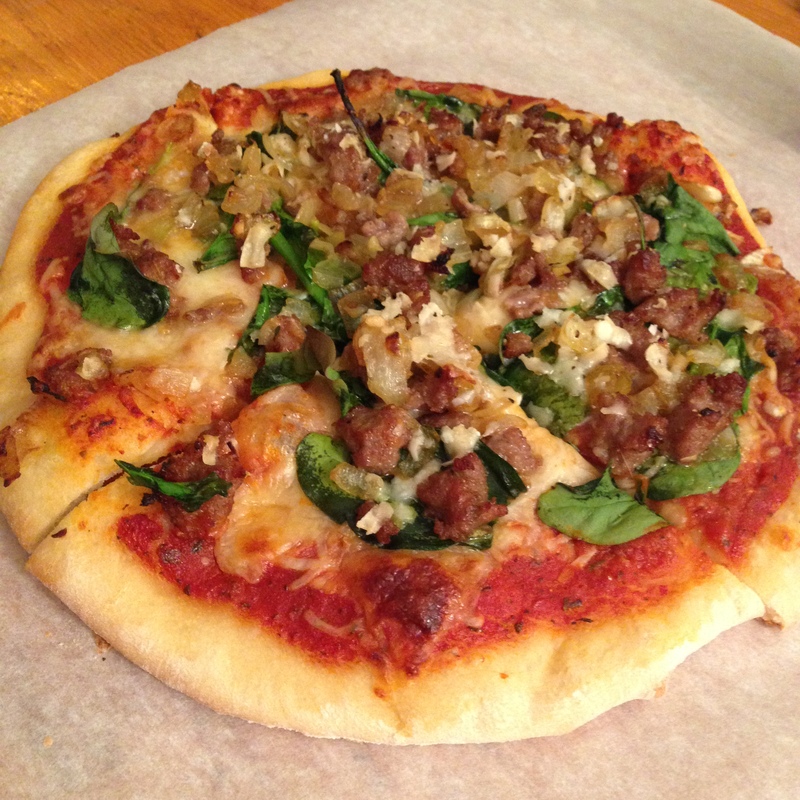 Sausage, onion, and spinach pizza | What is Mel Cooking? When Kelly and I cook pizza, we tend to go for fun and unusual (like this one), but today we decided to go traditional and just do sausage, onion, and spinach with Italian cheeses and a red sauce. I modified this recipe to fit my needs (and the ingredients I had available). Enough of your sauce to spread over. Feel free to use any sauce, not just the recipe I provided. If you did use my recipe, you’re going to have a fair amount left over. Bag it up and freeze for later! Throw together all of your sauce ingredients into a pot and heat for a while, until the ingredients start to break down. I heated mine on high until it started to bubble, then simmered it for about 10-15 more minutes while I prepped the rest of my ingredients. I used an immersion blender to get the sauce nice and smooth once it was done cooking, but if you like it chunky, go ahead and use as-is. Dice your onions, heat some oil (or butter, I’m not judging) in a pan and cook over medium-high heat until translucent (5-6 minutes? ), then toss in your chopped garlic and cook for an additional minute. Once done, transfer to a medium sized container. Brown your sausage in your onion pan (another 5-6 minutes? You don’t want to see pink), drain out the excess oil, and then add to your onion and garlic mix. Stir it up, baby! Roll out your dough over a well floured surface. Tonight we decided to do two personal pizzas, but you could also do a full-sized pizza. We tend to roll out our dough to about 1/4th in., either way. We transferred the dough to a pizza peel for assembly. If you don’t have a pizza peel or stone, throw onto a thin baking sheet. Start assembling your pizza. If you’re using a pizza stone, throw it in your oven and start preheating to 450*. (If you aren’t, pre-heat anyway.) Spread your sauce onto your dough. If you’re using a stone, this is where you want to speed things up a little, just to make sure your pizza is easy to move from the peel. We’ve found that the longer your sauce gets to sit on your dough, the harder it is to move onto the stone. Once your sauce is down, put on a healthy layer of cheese. Give yourself maybe 1/2 inch of breathing room along the edges of your dough. Next, throw on a handful of spinach. Don’t be afraid to pack it on, since it’ll cook way down. After that, throw on your onion, garlic and sausage mixture. Try to put it on evenly, and again, leave yourself a little room around the edges. If you have some extra parmesan on hand, sprinkle some on the top at the end. Finish with some salt and freshly cracked black pepper, if that’s how you roll. If you’re using a peel/stone, carefully transfer your pizza over to your stone. Cook until your crust is golden brown and your cheese is nice and melted, approximately 13-15 minutes. Just keep an eye on it, since it tends to go from perfect to overcooked in about a minute. Slice it up and enjoy. 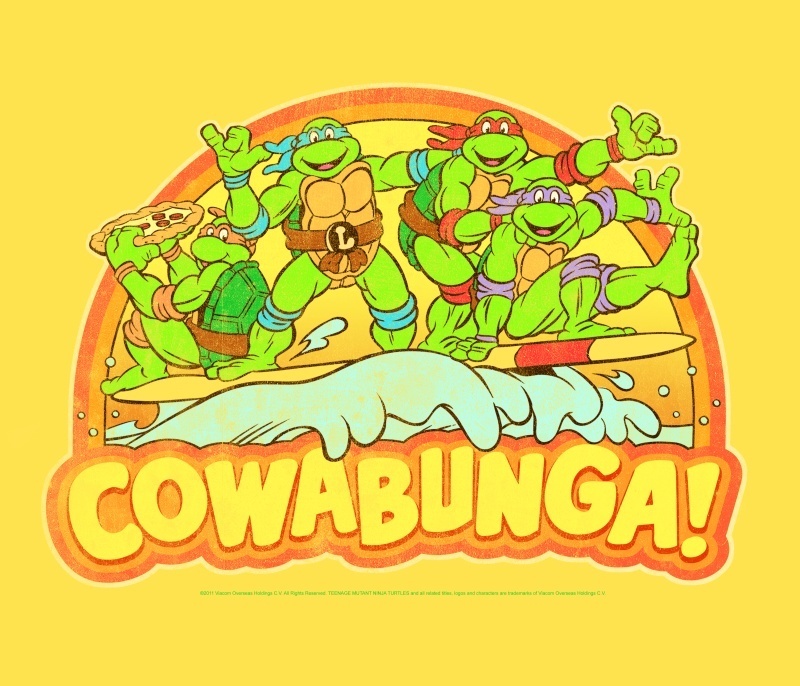 Cowabunga! Right out of the oven! Boston-based WordPress core contributor and craft beer fan. I design stuff at @automattic.